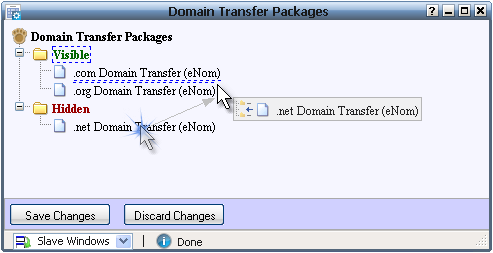 The screenshot shows that .com and .org packages are visible through the order form while the .net package should not be shown in the order form. Further, .com must appear before .org in the order form. Once you are satisfied with the changes you have made, click on the Save Changes button to save your changes to the server.You can use the Discard Changes button to reload the window with the current data on the server.